My first reaction to hearing about sportscasting is that it sounds like mindfulness. I teach mindfulness often in my therapy practice. I love the idea of sportscasting as an easy to grasp analogy of the non-judgemental, observing stance of mindfulness. I’m going to start using it as an analogy when teaching adults mindfulness. I also like the idea of teaching my children the seeds of mindfulness from infancy. 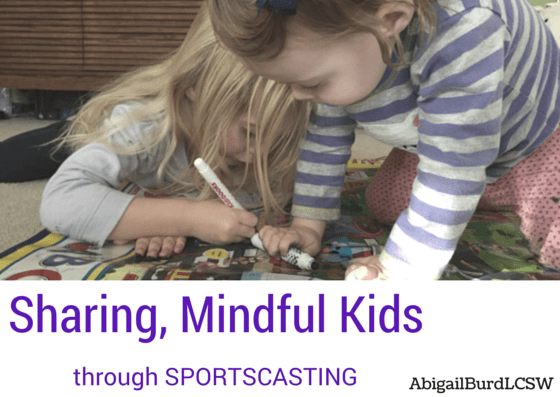 Turns out I am not the first to connect sportscasting with mindfulness, and I enjoyed this post by the Twin Coach, who uses sportscasting to narrate not just a child’s struggles, but the parents experience when things get tough. Because, let’s face it, parenting is frustrating and hard. How we express our frustration can make a serious negative impact on children. By modeling self-regulation, we are giving our kids a wonderful advantage. Remember, “perfect” parents not only don’t exist, they are inferior. Real life is full of mistakes and imperfections, and making them gives us the opportunity to model consequences, rising to challenges, rolling with changes, and grit. I am a mom to a one- and three-year-old as well as a professional who helps other parents. As a licensed psychotherapist in San Diego, CA, my special focus is on helping women of childbearing years with topics related to pregnancy, postpartum adjustment and parenting. Interesting! I will have to give this a try.